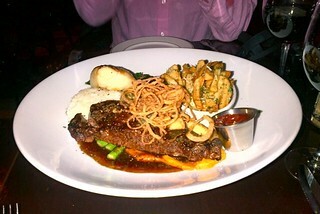 Steak and sablefish for dinner at Joe Fortes Seafood & Chop House on November 24, 2011. 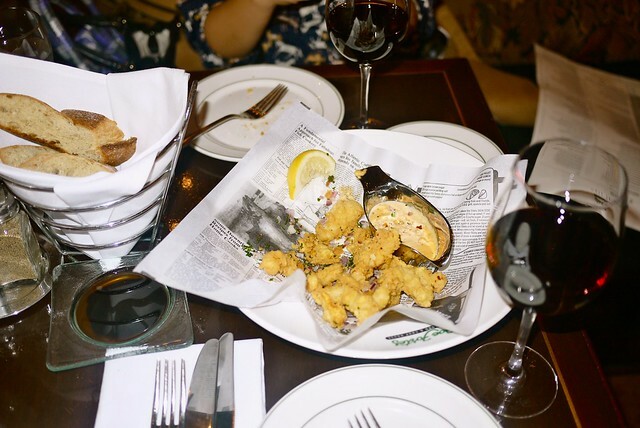 After a hectic day (not really at all) of eating and shopping (and drinking), followed by more eating and shopping, Sophia and I ducked into our favourite upscale seafood eatery and steakhouse for some deliciously, filling rich food. Mission accomplished. 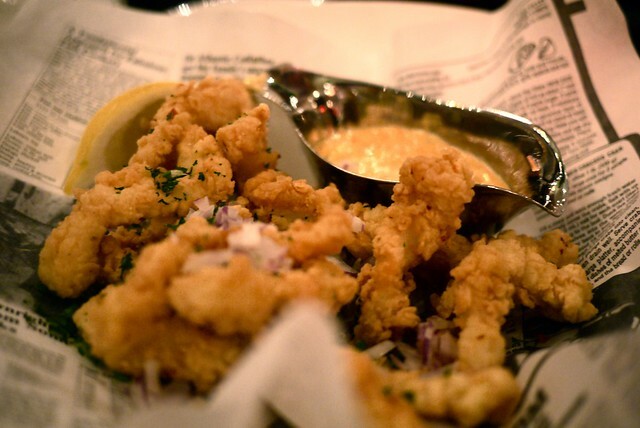 We dined on a deliciously non-ring, crispy calamari appetizer. 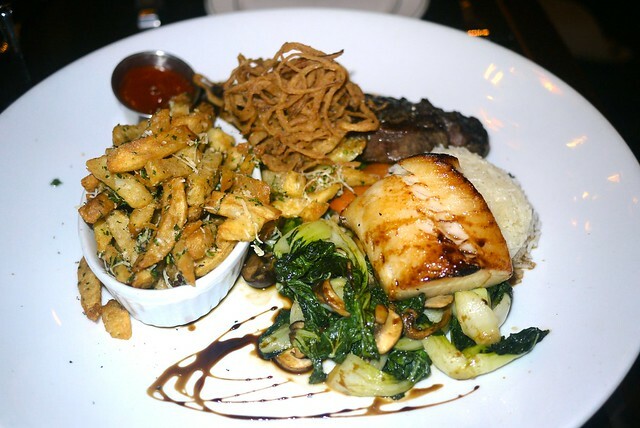 For the main attraction, we ordered both the miso marinated sablefish with baby bok choy, mushrooms, ginger scallion butter, and jasmine rice, as well as the 10oz. New York steak with truffle parmesan frites, roasted carrots, and cabernet jus, served on a big platter for easy sharesies. The meal was beyond tasty and delicious. I left so full. 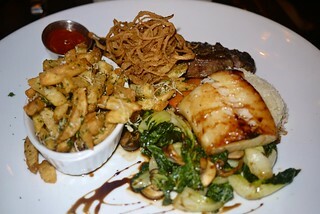 The sablefish was so soft and moist, melting in my mouth. The steak was nice and tender gobbled down. 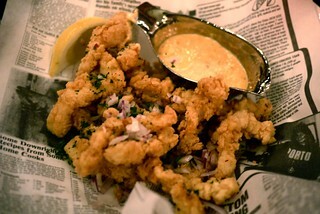 I loved the truffle fries and fried onion strings. Thanks to our excellent server Wade, whose birthday it was, we both enjoyed a glass of the Peter Lehmann Wildcard 2009 Shiraz red wine to complement our steak and fish upon his recommendation and a taste test. 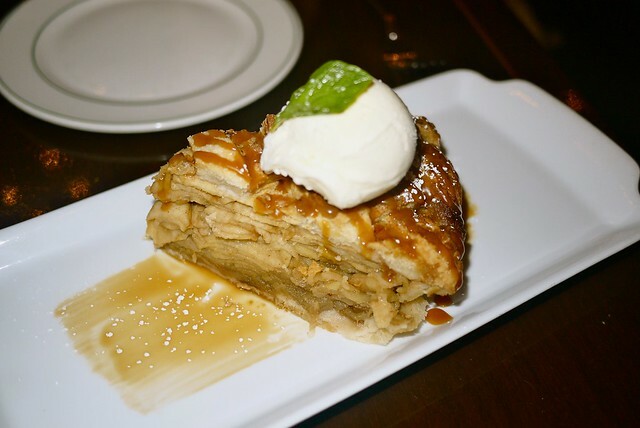 For dessert, we stuffed ourselves with homemade layered apple pie with vanilla gelato. 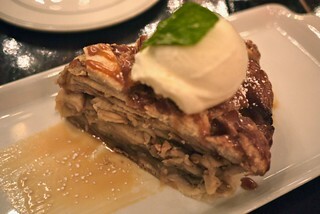 Yes, it was as insanely delicious as it looked. I can't imagine anyone finishing it all alone. We were beyond full after our scrumptiously large meal. I suffered from a severe food coma as it was a solid meal all-around.